Written by Keane Gruending, Communications Manager, Renewable Cities. This op-ed originally appeared in the November 9, 2017 edition of the Vancouver Observer. In Canadian cities, most people move around today the same way they did a decade ago. Which is to say, for the most part, personal cars still dominate, while walking, cycling, and transit represent a smaller piece of the transportation pie. Even Vancouver, which is held up as a fine example of transportation planning, sees 50% of trips in the city made by automobiles. While progress is being made in shifting to other modes, the way people get around seems destined to stay about the same for the foreseeable future. But behind the scenes the fundamentals of passenger transportation are undergoing seismic shifts. Converging developments in autonomous car technology, sharing platforms, and vehicle electrification promise to reshape the future of personal mobility in places like Metro Vancouver. Over the last six months, Tesla eclipsed General Motors as the most valuable car company in the United States. Uber registered its two billionth trip, while its ride sharing platform, UberPool hit a high watermark of nearly a million trips per day in China. Ford recently bankrolled a billion dollars into an artificial intelligence startup for vehicles. Daimler, Renault, Google, and others are developing and pitching their own driverless car solutions. To be sure, it will be some time before this tsunami of new technologies and business models hits the shores of personal mobility. Ever bullish, Elon Musk says most new vehicles will be capable of autonomy inside of ten years. Total SA, one of the world’s oil majors, claims that up to one third of new cars sold could be of the electric variety by 2030. More sober predictions peg mid-century as the point when autonomous vehicles become either the majority or even mandatory. Regardless of when autonomous vehicles, possibly electrified and shared, become mainstream, they promise to massively impact the shapes of communities—for better or worse. Even the limited adoption of driverless cars covering 5-10% of trips in a city, which is entirely possible within ten years, will have wide-ranging impacts on transportation systems. How are cities planning to tackle the challenges and opportunities presented by driverless vehicles? Some municipalities are staying ahead by hosting active trials. San Diego, whose regional planning agency sees driverless cars starting to displace conventional automobiles by 2025, is home to a cluster of tech providers. In Pittsburgh, Uber users were treated to free rides in luxury SUVs as part of an experiment. The caveat? Passengers had to be OK with a computer behind the wheel. Pittsburgh’s edge in the autonomous vehicles arms race is a high concentration of local robotics experts, thanks to its partnership with Carnegie Mellon. However, the truth is that most cities are not thinking about autonomous cars at all. A recent survey yielded that only four of the United States’ largest 68 cities are considering driverless technologies in their transportation planning. For its part, Vancouver City Council recently considered a report that presented two of the major consensus views about the future of autonomous vehicles in cities. In one camp, proponents of autonomous vehicles cite a utopian future where everyone—seniors and people with disabilities included—enjoy convenient, safe, and cost-effective mobility, without the burdens of private car ownership. The economics of shared and driverless vehicles make fossil fuel combustion uneconomic; why wouldn’t a fleet operator choose electricity over petroleum? If the suburbs aren’t going anywhere, then electric and autonomous vehicles are the ticket to completely renewable transportation. As cars efficiently hug each others’ bumpers in “platoon driving formation” in segregated autonomous car superhighways, the streets, including most parking, are reclaimed for more human uses such as treed boulevards, bike lanes, and playgrounds. Free from the burdens of bumper to bumper traffic, goods and freight movement are unlocked, providing economic benefits for everyone. The critical camp view autonomous vehicles as the ultimate suburban subsidy. Smart and efficient computer driving is a double-edged sword. The backside of the blade is that the time and expense penalties of commuting to work over long distances are removed; It’s transportation economics 101. Why live downtown if the suburbs offer cheap land, housing, and travel? No waiting at stoplights or circling city blocks looking for parking. Why take the bus when a roving autonomous taxi can be outside of your door in mere minutes? You can even nap or perfect your double Windsor Knot en route. The critical camp’s view is that autonomous cars will promote urban sprawl, chewing through land and resources. So how will municipalities, including those in Metro Vancouver, respond to this groundswell of new personal mobility? The advice coming from Bloomberg is that there is a narrow window of time to shape the future of driverless cars. With an eye to the mid-20th century takeover of city streets by automobiles, Peter D. Norton writes in Fighting Traffic, “There is a naive view that autonomous vehicles are in themselves beneficial. 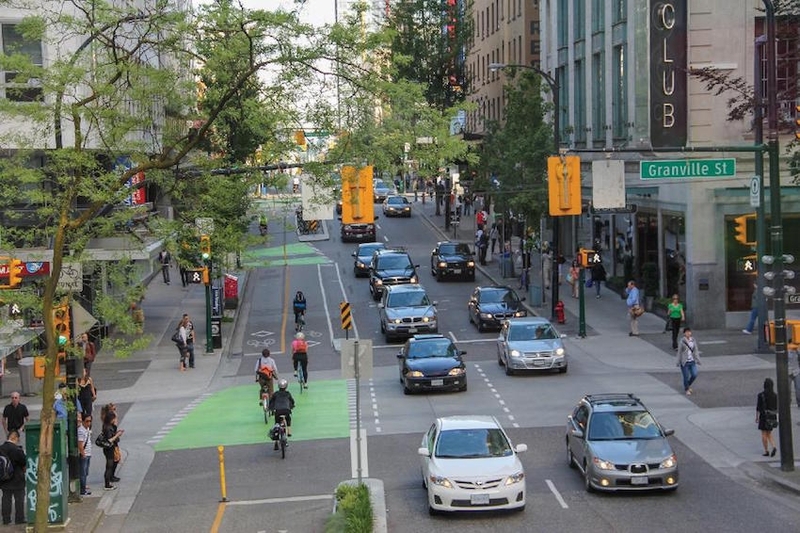 They can be beneficial only if we deliberately make them so.” This view is also reflected in a recent Greenest City Scholar report, recently submitted to the City of Vancouver. The report lays out some ground rules for dealing with autonomous vehicles and capturing local benefits: Autonomous vehicles need to complement active transportation, not the other way around. Walking and cycling need to be the easiest and most convenient way to travel. Plan for a zero-emissions transportation future and continue to build compact communities that support active and healthy transportation. The economic and environmental upside of autonomous vehicles done well are tremendous. But cities would be wise to keep people at the centre of the urban and transportation planning.